Our time in Monument Valley was magical, though the ironies of selling mostly foreign tourists equal parts Navajo and John Wayne culture were never lost on us. Every evening at our hotel they projected old John Wayne movies onto an outside wall for guests. We sat playing cribbage one night on the balcony outside our room and couldn’t help but overhear the music from “She Wore A Yellow Ribbon.” The soundtrack was full of cavalry tunes alternating between cheerful fife calling them into battle and mournful bugle for the dead. John Wayne had his own heroic music so even if you weren’t looking you knew when he was in the frame but so did the Indians whose presence was always noted with a tom tom rhythm. We wondered where those “Indian” themes in Hollywood ever came from. 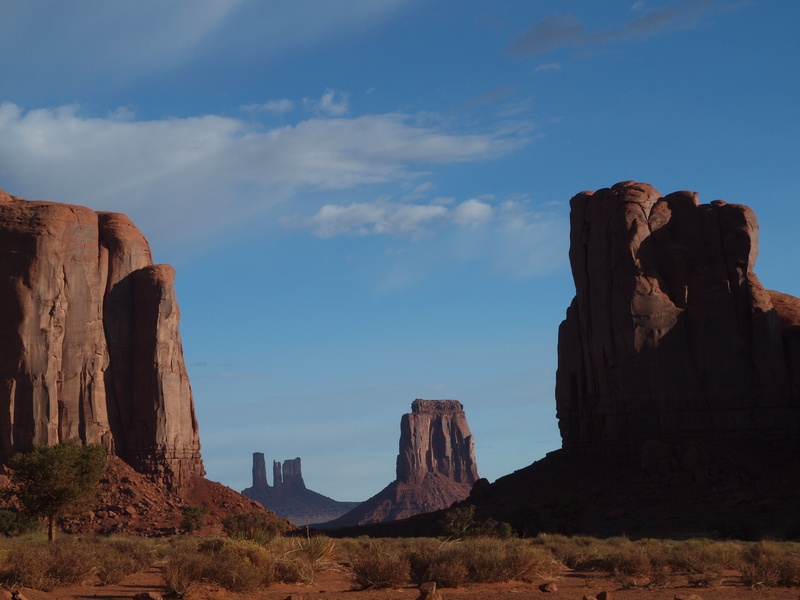 We knew that Navajos had played the part of Sioux Indians in these films so we asked our guide into the valley, Bobby Atene, the next day how they felt about these films as we drove past John Ford point. Atene is a young man who was trained as an electrician and lived some years in Phoenix, but when the housing market crashed and there was no more construction work, he came back to the “Rez” with his wife who works for the schools. He still does some electric work and works for a tour company while studying for a degree in kinesiology. He told us that the names used for many formations now, names like Totem Rock, Ear of the Wind, Hidden Arch, Hogan Arch, etc. came from the movie industry. John Wayne filmed several commercials with this tree as a backdrop. They used these place names to orient themselves and their crews while filming. 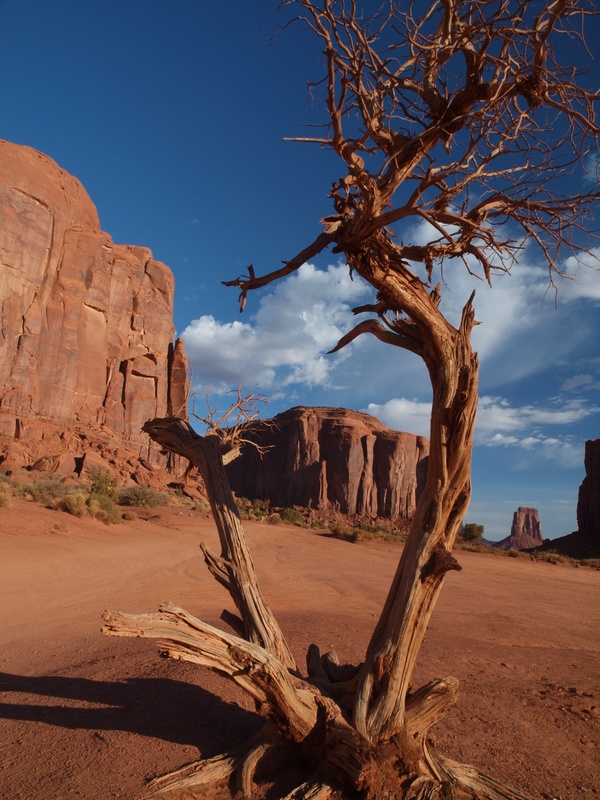 A twisted, dead cedar is known as the John Wayne tree because he shot several commercials there. In one of those, his horse was tied to the tree. The Navajos simply called the valley of astonishing buttes and mesas that range between 400 and 1,000 feet, “Light Within the Rock” which refers to the pale limestone that streaks through the red sandstone. It was because of the movie industry, Atene said, that the valley became famous and provides a living for so many people in their homeland. He didn’t see the movies as a source of resentment but as a source of income the Navajos could exploit to their own advantage. There were only a few families still living in the valley in areas closed to the public without Navajo guides and just a few sheep. Modern day Kokopelli, Bobby Atene, plays his flute in Monument Valley. 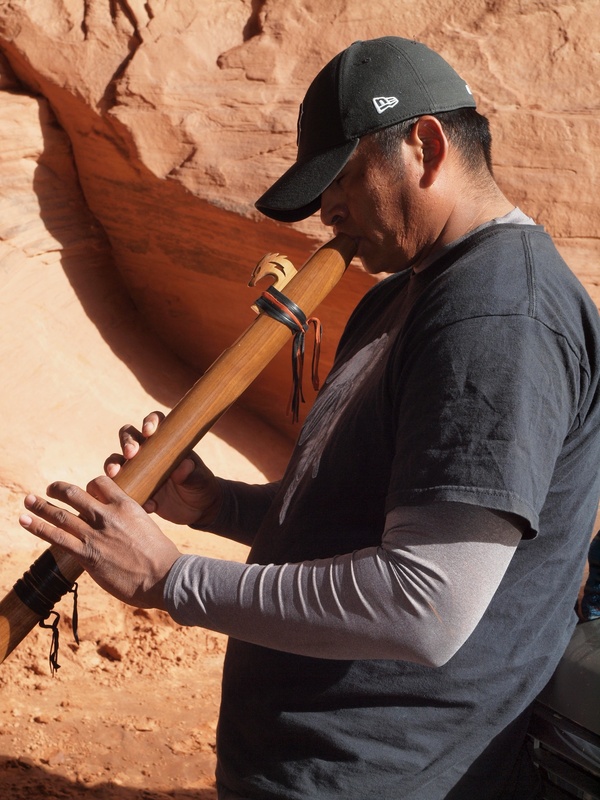 At a beautiful place called Hidden Arch, Atene played the flute for us, a song he wrote to commemorate the Long Walk of the Navajo. Bobby played the flute at the Hidden Arch. On our way back to the hotel after four hours of astonishing views Atene told us his version of how the Merrick and Mitchell buttes got their names. “When Kit Carson came to clear out the Navajos from this valley a few survived by hiding on the mesas.” He pointed to a large red stone butte to our left. They say there are two hogans on top of that mesa. On the back side there is a gradual slope and a rope hanging from the top. It is still there. They say that the men would come down at midnight to get water for the others on the mesa. Kit Carson tried to prevent this by killing one of his own horses and throwing it into the spring to poison the water. Finally, most Navajos had to turn themselves in. The Navajos were driven out of Monument Valley by forces led by Kit Carson in 1864. We heard some more Kit Carson stories as we toured Navajoland. To them it was as if Kit Carson himself were everywhere and had a hand in every action. Needless to say, the reputation of Kit Carson is one thing in Taos and quite another here. 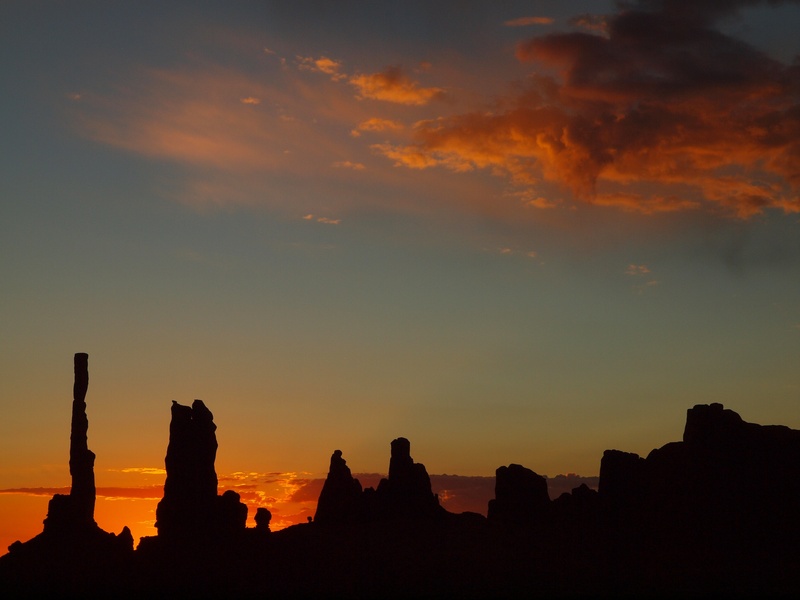 It was hard to leave Monument Valley where we had seen the most incredible sunrises amidst the majestic red rock spires but we looked forward to a visit to the Hopi villages and on to the other side of the Navajo Reservation to visit old friends from our five years in Fort Defiance.